Blepharitis is a very common eyelid inflammation, affecting approximately 33% to 40% of the adult population. Research has estimated that this eyelid inflammation is responsible for over a third of all cases of dry eye syndrome and of those having problems with eye irritation. It affects both males and females equally. Some consider this to be the most common eye disease. The most common symptom is eye irritation and discomfort. Your eye may feel gritty, dry, and have the sensation that 'something is in the eye'. Dryness and/or watering becomes more prominent. If you wear contact lenses, you may feel that the lenses irritate your eye more and you are no longer able to wear them for prolonged periods of time. Your eye and your eyelids will also appear a bit red and inflamed. Your vision should not generally be affected although it could fluctuate due to your eyes being too dry or being too watery. WHAT ARE THE DIFFERENT TYPES OF BLEPHARITIS? In general, eyelid inflammation can be defined as either anterior (front) or posterior (back). This depends on the location where the eyelid is inflamed. It is common to have a mixture of both types of inflammation. Anterior blepharitis: This refers to inflammation of the outer edge of the eyelids, involving mostly the roots of the eyelashes. 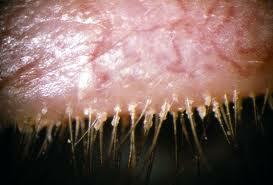 Clinically, this is seen as crusts, dandruff and debris on the eyelashes. This can be associated with seborrhoeic dermatitis, a general skin condition that results in flaking and scaling of the skin. Notice the typical appearance of crusts and dandruff at the base of the eyelashes. This is the hallmark of anterior eyelid inflammation. These crusts may be associated with microorganisms such as Staphylococcus bacteria and Demodex mites. Posterior blepharitis: This refers to inflammation of the meibomian glands (oil glands in the eyelids that secrete oil to stabilize the tear film and lubricate the eye surface) in the inner edge of the eyelids. Clinically, this is seen as inflamed looking glands which are clogged up with impacted oil globules. This can be associated with rosacea, which is a type of skin inflammation that affects the face. 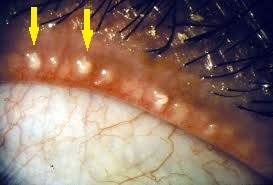 The yellow arrows highlight the inflamed and clogged up meibomian glands. The oily secretions normally drain easily from the meibomian glands, but are unable to do so when the glands are inflamed. The oils that do get secreted may cause the tears to have a foamy appearance. Most of the time, it is not known why the eyelid becomes inflamed this way. It is thought that colonization of the eyelids by microorganisms can cause eyelid inflammation due to toxicity from their waste products or even from direct attack on the eyelid tissues. Examples of this would be eyelid inflammation caused by Staphylococcus bacteria and Demodex mites. Immune system-mediated damage may also cause eyelid inflammation, particularly when there is also a general overall skin disease such as in seborrheic dermatitis and rosacea. Staphylococcal blepharitis is a result of infection by bacteria called Staphylococcus aureus. It is more commonly seen in women. It typically results in broken or loss of eyelashes. This infection can be severe and cause eyelid problems such as ectropion (outward turning of the eyelid), entropion (inward turning of the eyelid) and trichiasis (inward turning of the eyelashes). All these can lead to damage to the cornea (front window of the eye) and cause visual problems. 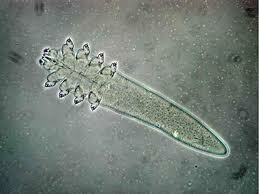 Demodex blepharitis is caused by Demodex folliculorum mites. Demodex mites (see right) have tiny claws and body scales that allow them to anchor themselves in hair follicles, their natural habitat. Eyelid inflammation occurs when there is heavy mite infestation which clogs up the hair follicles. Seborrheic blepharitis occurs when eyelid inflammation is associated with seborrheic dermatitis. Seborrheic dermatitis is a common skin condition that makes the skin look greasy, scaly and flaky. It mostly causes scalp dandruff, although it can also affect the face, chest and skin creases. It is thought that seborrheic dermatitis may be related to hormones, nutrition, stress and possible fungal infection. The best way to treat the dandruff associated with seborrheic dermatitis is to use shampoo that contain salicylic acid, selenium sulfide, zinc pyrithione or coal tar 2 to 3 times a week. Make sure you rub the shampoo into your hair and scalp thoroughly. Leave the shampoo on your hair and scalp for at least 5 minutes before rinsing off. If this does not help, you may require prescription steroid lotion to apply on your scalp in addition to the shampoo. Rosacea inflammation occurs when the eyelid inflammation is associated with rosacea. It is a skin condition that usually affects the face. Typically, the nose, cheeks, chin and forehead will look red with dilated blood vessels and pimples. They skin of the nose may become red and thick (rhinophyma; see right). The exact cause for rosacea is unknown. The main treatment for rosacea is antibiotics, which are taken both as pills and as a skin cream. It will take at least a few months before an improvement is seen. HOW CAN BLEPHARITIS BE TREATED? While there is no 100% cure for this disease, it is certainly possible to treat and control it. Reduce eyelid irritation: This is an important consideration. If you are a contact lens wearer, it may be helpful if you discontinue their use or at least reduce the number of hours you wear them. Minimizing the amount of mascara and eye makeup that you use will also help to lessen the eyelid inflammation. If your eyes feel irritated, you can use artificial tears to soothe your eyes. Lid hygiene: Lid hygiene is the cornerstone of treatment for blepharitis. By scrubbing the edge of your eyelids with a clean cotton bud, washcloth or gauze pad dipped in diluted baby shampoo, you remove debris and bacteria from the base of your eyelashes as well as massage the oil out of the meibomian glands. Special over-the-counter products are now available to help you clean your eyelids. There also is a commercial eyelid scrub combined with tea tree oil that may be beneficial for Demodex-related inflammation. Lid hygiene can be achieved by scrubbing the edge of the lids with cotton buds or eye pads dipped in diluted baby shampoo. Start from the nose-end and scrub towards the ear-end. Initially doing this can cause your eyelids to feel slightly sore, but you will eventually feel better for it. For best results, incorporate lid scrubbing into your daily routine. Antibiotics: These can be in the form of eye drops or ointment (including Fusidic acid and Chloramphenicol) to clear infection from your eyelids. You may also be given a course of antibiotic tablets, such as Doxycycline or Minocycline, to be taken over a 3-month period. The antibiotics reduce the amount of bacteria on your eyelids and by prevents the production of free fatty acid from the meibomian glands (free fatty acid is a degradation product that promotes eyelid inflammation). However, they may cause stomach upsets, make your skin more sensitive to sunlight, and interfere with your other medications. You should not use these antibiotics if you are pregnant or are breastfeeding.